There are three legislative assembly constituency in Jalaun district for the 2017 Assembly elections. They are 220 Kalpi, 219 Madhaugarh, 221 Orai. When Uttar Pradesh assembly election 2017 is getting ready to electios new Assembly, Jalaun is not anywhere behind in the election heat. 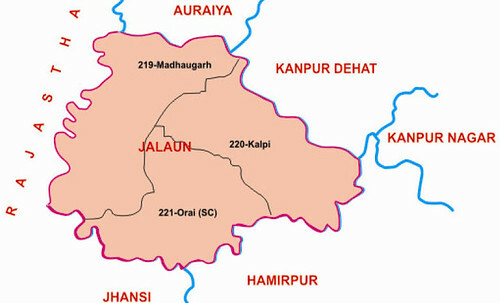 Jalaun District (Hindi:जालौन) is a district of Uttar Pradesh state of India. The district is named after town of Jalaun, which was the former headquarters of a Maratha governor, but the administrative headquarters of the district is at Orai. Other large towns in the district are Kalpi, Konch, and Madhogarh.